It is our pleasure to welcome your attendance at SPIE's 2010 International Symposium on Remote Sensing. An excellent technical programme has been prepared, focusing on recent advances in sensor technology, next generation satellites, remote sensing of the Earth and its environment, atmospheric propagation, and signal and image processing. 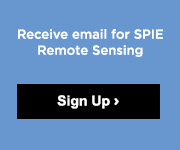 This year's event will be held in Toulouse, France, and is SPIE's 17th Remote Sensing Europe meeting. Previous symposia were held at various locations throughout Europe, including in Rome, London, Paris, Sicily, Toulouse, Barcelona, Crete, Grand Canary, Bruges, Stockholm, Florence, Cardiff, and Berlin. Nearly 500 presentations prove again that this event is recognized as an important forum for science, government, and industry to access and share information on remote sensing. The event's focus is especially on the research aspects of remote sensing, with a concentration on European and international science and technology. The symposium features nine conferences including a special airborne remote sensing session, each including oral and poster presentations, as well as plenary presentations. A Welcome Reception will provide an opportunity to exchange ideas and network in a more personal way. The 17th SPIE Symposium on Remote Sensing will be co-located with the sixth SPIE European Defense & Security Symposium, and will provide an excellent opportunity to explore new opportunities to collaborate with new partners from other fields of activity. The program promises an exciting week, with excellent science and technology in a setting conducive to international interchange, and we would be pleased to have your participation. Finally, don't miss this opportunity of visiting beautiful Southern France and seeing the historic Ville Rose ("Pink City"), Toulouse, the home of European aerospace.